Lovers of beer, rejoice! The Hydro Flask Growler, world’s first vacuum insulated beer growler, has finally arrived to keep your most-loved beverage chilled and carbonated to the optimum temperature – it’s looking pretty damn sharp, too. Designed for the main purpose of keeping your beer chilled at the optimum drinking temperature, ideally carbonated and safely contained in transport, the 64oz Hydro Flask Growler features double wall vacuum insulation in order to eliminate any external condensation and keep your beloved iced beverage extra-cold for as many as 24 hours. On top of that, hot liquids will also preserve their temperature for some 12 hours in this original container so may also decide to use your growler as a coffee or tea carafe. 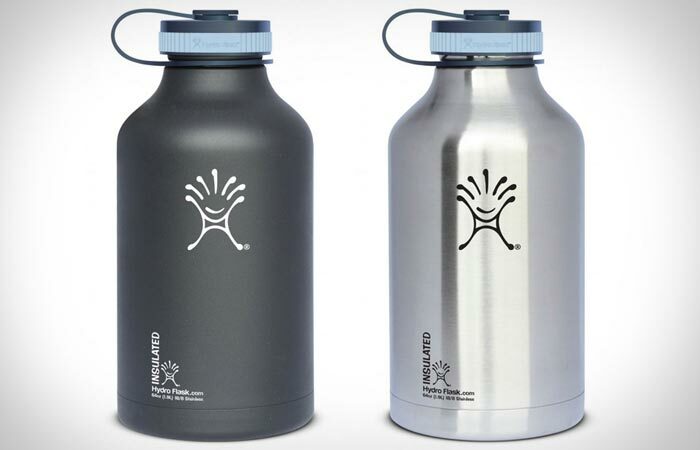 The Hydro Flask Growler interior is made from non-porous food-grade 18/8 stainless steel, canceling out potential heat transfer and keeping any undesirable external flavors, aromas or bacteria safely at bay. The wide 2.2-inch mouth opening makes pouring extra-simple and it’s super easy to clean too, while the BPA-free flat cap sports additional insulation to make sure your beer stays as cold and fresh as when you first poured it in. Made from 100% recyclable materials and outfitted with a smart powder-coated matte finish, the lightweight Hydro Flask Growler will make sure your beer stays cold and savory on the go.